Carroll’s student section knew Elizabeth Bush’s 3-point shot was good as soon as it left her fingertips. They were right, during the first half of the Patriots’ girls high school basketball home opener with Cincinnati Wyoming. Carroll hit 11 threes and won, 68-39, Nov. 23 in Riverside. Carroll’s Julia Keller hits a free throw in the first half of Friday’s Nov. 23 win over Cincinnati Wyoming. Keller led the Patriots in scoring with 15 points. 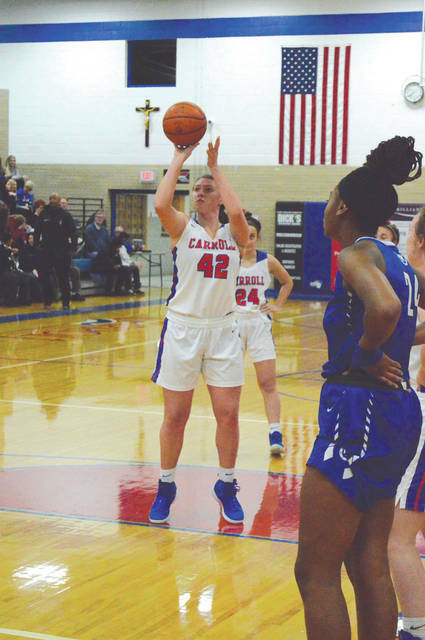 RIVERSIDE — If one looked at the Carroll Patriots’ 68-39 girls high school basketball result Nov. 23 over visiting Cincinnati Wyoming, it would seem as if coach Cecelia Grosselin’s bunch had already hit mid-season form. But Grosselin knows her girls can be even better. “(With returning starters Allie Stefanek, Elisabeth Bush, Julia Keller and Ava Lickliter back in the lineup), for them it probably felt like they were in mid-season form,” Grosselin said. “But based on the group we have, and from seeing what they can do in the past, we know that they can do better, from a coaching perspective. Grosselin said 10 of her players also played on the Carroll girls soccer team, a group that won a sectional title and played for a district crown before falling to top-seeded Alter 4-3 in overtime barely a month ago, and said some of her kids may not be quite in basketball playing shape just yet, because of that soccer run, which led to the numerous fouls. “Once they all get their legs under them, I have no doubt that we’ll reduce those fouls. But we do have to work on that,” she said. Due to a scheduling quirk where an originally scheduled opponent for next week had to reschedule a contest, Carroll has a week to get their legs under them. Their next contest is now set for Saturday, Dec. 1, a home game with Wilmington. “We’ll have our legs by then, I’m sure of it,” she said. Some of the Carroll players were heard after the game teasing Allie Stefanek for messing up their sequential order of scoring. Julia Keller led the Patriots (1-0) with 15 points, Elisabeth Bush had 14, Ava Lickliter finished with 13, and then Stefanek went and messed up the order by scoring 11. 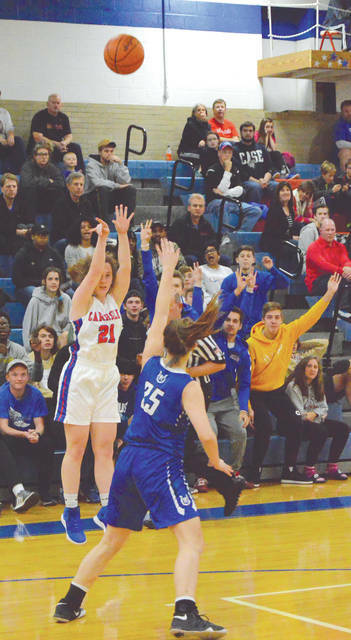 The Patriots drained 11 three-pointers, with Stefanek hitting three of them. Elly McCullum-Smith led Wyoming (0-1) with 13 points, Nia Kemper scored nine points, and team’s top returning scorer, Sky Thomas, was next with eight. The Cowboys next play a 7:30 p.m. Tuesday, Nov. 27 home opener against St. Ursula.